Historically, nutrition has been an overlooked component of athletic training and performance, but it has become increasingly apparent that if you want your body to perform you need to fill your tank with high quality fuel. This month’s featured practitioner is no stranger to promoting the importance of nutrition for peak athletic performance. As a Registered Dietitian and Certified Personal Trainer in Jacksonville, Florida, Mindy Black specializes in sports nutrition, weight management, and medical nutrition therapy and is the Director of Performance Nutrition for the Jacksonville Jaguars. Her past experience includes serving as a Sports Nutritionist for Jacksonville University and the University of Florida Athletic Association, independent work with many professional and elite athletes, and weight loss counseling in and around Jacksonville Beach. Mindy graduated from the University of Florida with a B.S. in Food Science and Human Nutrition and a Masters in Exercise Physiology. She also has experience in clinical nutrition and currently works closely with several doctors and chiropractors in the Jacksonville Area. We hope you enjoy getting to know Mindy as much as we did, and please join us for “Performance Nutrition: Making Good Athletes Great!”, an exciting webinar hosted by Mindy on April 12th, 2019 at 2:00pm EST. A: I am married with 2 boys, ages 4 & 7. As a family we love being active in our beach community, traveling the globe, and trying out different cultures’ food! I am a Sports Dietitian and have been the Director of Performance Nutrition for the Jacksonville Jaguars since 2014. Prior to being with the Jaguars, I work with athletic teams at the University of Florida and Jacksonville University. I have also owned my own private practice since 2007, Dietitians of Palm Valley. Q: How long have you been an RD? Do you have any additional certifications/specializations/awards/publications you’d like to tell us about? A: I have been a registered dietitian for 17 years and have been board certified in sports (CSSD) for the last 10 years. In past years I have been an adjunct professor at the University of North Florida for Exercise Physiology and Sports Nutrition courses. A: I initially found Orgain when looking for dairy free alternative protein powders for my athletes. Not surprisingly, Orgain Plant Based Protein Powder was one of the few vegan powders that passed our player taste tests. Later down the line I was able to use those same powders with players who needed a non-dairy option and eventually expanded to the players who are pescatarian/vegan as well as those who just enjoy the taste. What is your personal favorite Orgain product and flavor and why? A: Plant Based Protein Bar in Chocolate Chip Cookie Dough. For digestive reasons, I am gluten & dairy-free. This is one bar that tastes good without the gluten or dairy! A: Due to tight schedules and tough workouts, post-workout shakes are an important part of our athletes’ daily recovery plan. Orgain Plant Based Protein Powder is used in the shakes that fuel about 1/3 of our athletes who have digestive issues with dairy or who are vegan. Orgain Plant Based Protein Bars are stocked in our recovery station for players who need a quick grab-and-go option throughout the day, to take to meetings, or after weight training sessions. 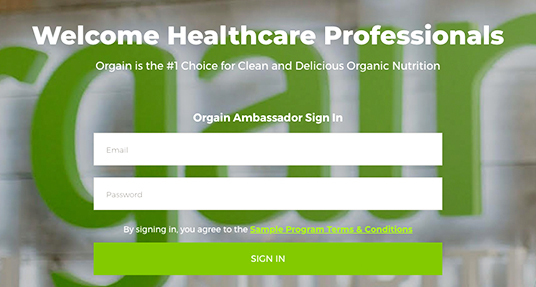 We have received your feedback and improved the Orgain healthcare website to make it even easier for healthcare professionals to request samples, activate their ambassador account, and to log in to order additional samples. Visit healthcare.orgain.com today to check it out for yourself! Every April there is a nationwide effort to promote autism awareness, inclusion and self-determination, and to assure that each person with Autism Spectrum Disorder (ASD) is provided the opportunity to achieve the highest possible quality of life. According to the Centers for Disease Control, autism affects an estimated 1 in 59 children in the United States today. All ethnic and socioeconomic groups are affected and early intervention helps afford the best opportunity to support healthy development. Because many individuals with autism have food aversions, sensitivities, or behavioral issues that can make mealtime challenging, it is important to address nutrition issues early on to help prevent nutritional deficiencies. A meta-analysis in the Journal of Autism and Developmental Disorders found that children with ASD are five times more likely to have mealtime challenges such as tantrums, extreme food selectivity, and ritualistic eating behaviors. The researchers also found inadequate nutrition was more common among children with autism than in those unaffected by ASD. More specifically, they found that calcium and protein were deficient in children with ASD. Unfortunately, if chronic eating problems go unresolved, researchers noted that they lead to an increased risk for social difficulties and poor academic achievement. Ultimately this may also lead to an increase in risk for diet-related conditions such as obesity and cardiovascular disease in adolescence and adulthood. Alternative diets, i.e. those that exclude casein or gluten, have been used by some in an effort to improve ASD related symptoms or medical issues. However the researchers expressed additional concerns about such diets as they can increase the challenge of ensuring adequate, well-balanced nutrition. For healthcare providers working with children or adults with ASD, nutritional shakes can be a valuable tool to help ensure a well-balanced diet that fills nutritional gaps that may result from aversions, sensitivities, or behavioral issues. Orgain Plant Based Nutrition Shakes [Include link to product page] are a wonderful option as they are high in protein and calcium (as well as 20 other vitamins and minerals), are gluten free, and free of casein. These shakes are often applauded for their smooth texture and excellent taste making them an excellent option for individuals with taste or textural aversions. And, while these shakes were designed for adults, they are often happily consumed by children. We suggest offering a half serving to children ages 2 through 11. 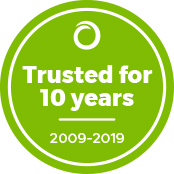 While Orgain may seem like the “new kid on the block”, we are actually thrilled to be celebrating our 10-year anniversary! Since 2009 we have been relentlessly pursuing the goal of making clean, organic nutrition taste great and we are forever grateful to our loyal practitioner fans for helping us spread the word. So, thank you and raise a shake to another 10 years!